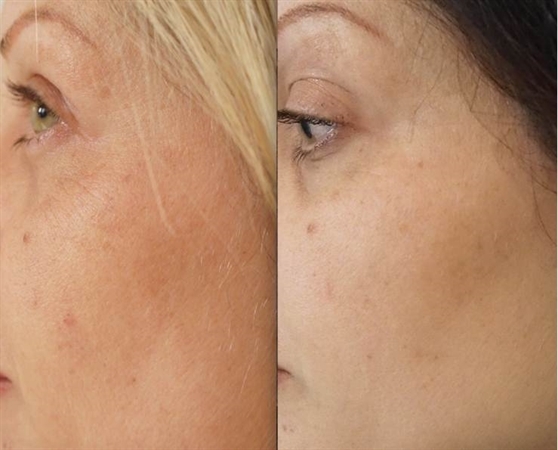 Before and after 1 treatment of 3mls of skinboosters in cheeks. Skin boosters are related to dermal fillers in terms of what they are made of, the difference with skin boosters compared with dermal fillers is that they are not structural, ie they only improve the skin, rather than improve the supporting structures of the face. Over time, levels of the naturally occurring substance responsible for maintaining skin hydration, h********* a***, reduce. H********* acid is a moisture binding substance in the skin, giving the skin firmness, plumpness and elasticity. It helps prevent lines wrinkles and fold forming. Moisturising the surface of the skin with creams cannot replace the h********** a*** loss which is occurring over time. The solution is to restore the skins natural hydration where the loss is occurring. What is the procedure for skin booster injection? The patient has consultation and photos and signs a consent form. A numbing cream (eg EMLA or LMX ) may be applied to the area prior to the treatment (45 minutes prior is ideal) Glad wrap may be used over the numbing cream to increase its effect. How will I look immediately after the skin booster injections? The skin around the 4 entry points for the cannula may be white due to local anaesthetic. Who is suitable for skin booster treatment? Improved skin elasticity tone and thickness. The results will be seen immediately.